On Sale Now! Free Shipping Included! 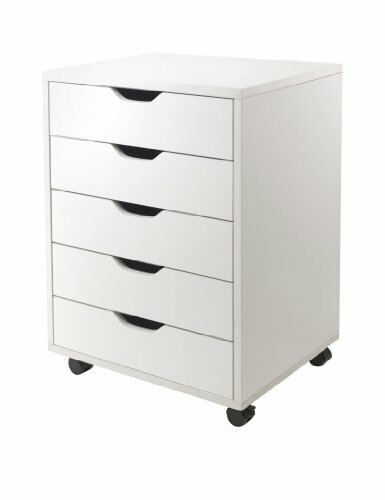 Save 3% on the Winsome Halifax Cabinet for Closet/Office, 5 Drawers, White by Winsome at Momiji Studios. MPN: 10519. Hurry! Limited time offer. Offer valid only while supplies last. Halifax storage carts feature a multitude of drawers for easily accessible storage in your home office, kitchen, craft room, or a child's room. Halifax storage carts feature a multitude of drawers for easily accessible storage in your home office, kitchen, craft room, or a child's room. Optional locking casters to use them with or without casters for stationary or mobility storage. Crate a workspace by placing tabletop over 2 of 7-drawer carts for high table or 5-drawer creates a normal table height. Available in white, black, walnut finish. Choose from 5-drawer or 7-drawer with cut-out drawer pull. Drawer inside dimension 15.90-inch w by 11.73-inch d by 2.55-inch h. If a caster is used, 2.16-inch is clearance between floor and bottom of cart. Assembly required.